Read the tag line again….the ‘I’ is YOU…you the intrepid and determined runner who has signed up for a 100 Days of Running and NOT me the runner-blogger. 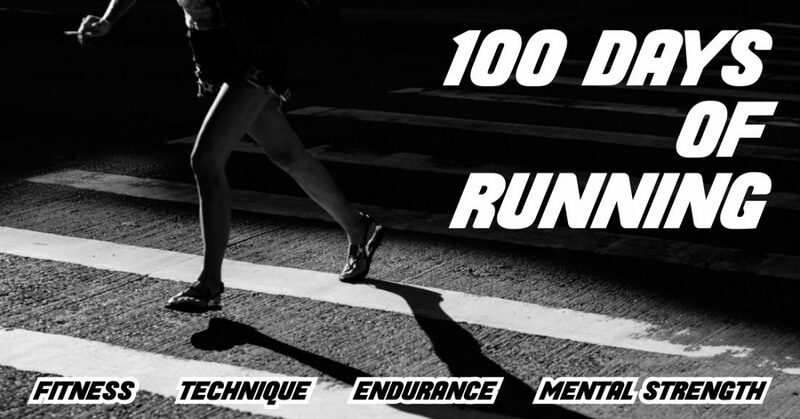 The WILL in the tagline is your endless motivation…your steely determination….to conquer these 100 days and come out stronger, faster as a runner and more importantly….with an iron self-belief that you can take on any challenge and triumph over it ! You have the motivation…you have the GO….but the road to finishing the100 Days of Running is littered with wannabes who gave in to mental weaknesses, injuries or life in general. Finishing the 100 days is a game of having achievable goals, smart planning, milestone checks and an unwavering perseverance to go through it…COME WHAT MAY ! Some pointers…. Technique – Improve your running form. Read – The Perfect Running Form. Even better if you add Chi-Running to your 100 days of Running. Read – My Experiments with Chi-Running. Aerobic Fitness and Endurance – Increase your aerobic fitness and stamina to run longer races . Runners around the world are using the Heart Rate/ Maffetone Method to build long-lasting endurance. Read – All About the Maffetone Method. Why is the Long Slow Distance a staple with the best runners in the world? Read – The Magic of Long Slow Distance. Speed – Read : All About Speed Building. Motivation and Mental Strength – Just be able to do it everyday . Read – What is the Runner’s Mantra. What makes you special as a Runner -Read: You are not normal. You are an Endurance Runner. Just be able to do it every day …. master the art of recovery ! What am I doing ? Aim – Improve my marathon time. Key Weakness – Endurance. Focus Areas in order of priority – 1. Just be able to do it everyday. 2. Aerobic fitness and stamina. 3. Strength, mobility and flexibility. If I do it right….speed and optimum running weight will be happy by-products. QED. Having a clear goal is not enough without a training plan. Obvious question – how to make a plan ? Divide the 100 days into three/four phases of several weeks each. Each week to have a specific goal and each day to have specific activities ! Sounds complicated…but it is actually very doable and gives a method to the madness of 100 days ! How am I doing it ? Phase 1. Three weeks of Just be Able To Do It Phase…ie get the body used to running seven days a week ! No mileage or speed targets. Focus on low mileage alongwith development of good running habits (we are all guilty here) – warm up, post run stretching, mobility, form, flexibility and recovery drills. Phase 2. Eight weeks of increasing Aerobic Fitness and Stamina….I intend to follow the Maffetone method (see link above). Lots of slow running with increasing weekly targets ! Strength, mobility and flexibility will remain key focus areas. Phase 3. Three weeks of Classical Marathon Training – LSDs, tempos and speed work ! Weekly Plan. The seven day plan for each week is the real manifestation of the 100 days. I intend to listen to my body and make my weekly plans as I go along. There will be a mix of hard and easy days after the first phase. The minimum 2k is my rest day ! Whatever is your goal, whatever be your plan….make it SMART…Specific, Measurable, Achievable, Realistic, Timely ! Be conservative in setting your targets. Too much, too soon will spell the end your crusade for 100 days of running. Good hydration and healthy nutrition are non-negotiable. Reminder to self – Gee Ess not more than two small Single Malts ! My two magic bullets – a gentle round of four stretches (https://www.youtube.com/watch?v=ABKNQmb026Q ) and a glass of warm milk with turmeric (Dudh Haldi) makes sure that I wake up fresh without any stiffness the next day ! You may have the motivation, you may have the goals… but… life has a way of getting in the way of the best laid plans – too tired, too stiff, bored, no time – excuses…excuses ! Well….if life wants to trick your brain…so can you. Declare your intention to run the 100 days to the world. Post about it ad nauseum. Join a running group. Find a running buddy who is as mad as you about running. Read : The Runner’s Bond and why it is Special. Mark a cross on a calendar for everyday of running. Believe me that the satisfaction of seeing and unbroken streak of crosses can be quite a motivator ! Keep small incremental targets leading upto the big one. A small victory everyday – win the weekly battle – emerge triumphant in the 100 day war ! There you have it….my thoughts on rocking the 100 Days of Running… But every runner is different. I urge to not take my thoughts on face value. Think, introspect, assess and then make your own goals, plans and motivational hacks as per your body, mental makeup and environment! Happy Feet ! You are Invictus…indestructible….unbeatable. 100 days is just a metaphor for life. YOU CAN AND YOU WILL kill any challenge life throws at you. End of story.